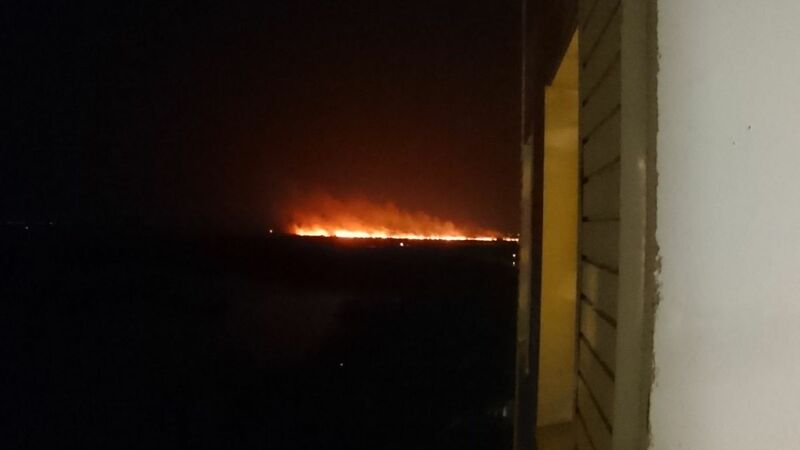 Ukraine's State Emergency Situations Service has established the cause of a large fire in Kyiv's Darnytsky district on Wednesday evening, saying that it was bulrush that caught fire, according to The Village Ukraine. Social media users earlier proposed a theory that it could be a helicopter that has crashed, The Village Ukraine wrote. The same theory appeared on Russian propaganda-oriented websites. The Ukrainian authorities have not confirmed those reports. Emergency service workers have reported a fire outbreak on an area covered by bulrush. Fire brigades are working on the scene, it wrote. Meanwhile, a journalist from the television channel ZIK reported that the fire broke out near a holiday village in the Osokorky area at about 20:00 local time on Wednesday. In his words, it is the ninth kilometer from Kyiv's Bazhana Avenue on the line with the village of Vyshenky. It is close to high-voltage power transmission lines. There were two firefighting vehicles close to the scene, he said, but they could not get to the point of the outbreak because of a canal and neighboring swamps.